You might think the title is wrong and was supposed to be – Know Thy Skin. Nope. Knowing your skin is way less important than knowing yourself. The very first thing you have to do is Know Thyself. Who are you really when it comes to skincare? Who are you at 11:45 pm when you’re in your jammies and just woke up from bingeing OZARK on the couch? Are you really going to wash your face and apply your night cream before bed? Or maybe you’ll wipe a cleansing cloth over your skin before climbing under the covers – or maybe, you’ll guiltily climb in bed promising yourself a cleansing scrub and mask tomorrow. Knowing, and owning, your true self is the first step to great skin. There are many skincare professionals who can help you with products and routines, but you have to be honest about who you are and what you will realistically do – on a regular basis. Might we suggest a 5-Step Fresh Start? Trial-sized, free and foil-packed samples. If you wanted that brand, you would have bought it by now. Scented ones that smell good, but don’t do anything – or maybe even clash with your real fragrances. Stuff you thought you’d use, but you just never did. It doesn’t matter why – it just wasn’t right for you. Expired products. Check the date on the bottom of the container if there is one, or look at the little icon that resembles a can. This little icon tells you how long after you open the container that you can safely use it. 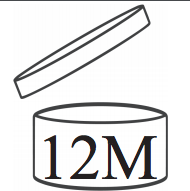 If it says 12M and it’s been more than a year that you’ve had it open, toss it. Inventory what you’ve got left. This is the stuff you use. You love it and it works and it’s easy enough to get when you run out. This is your foundation. Now let’s build on it. Give some thought to what you are willing to do for your skin on a regular basis. Two-steps? Day and night? Only in the shower? Be honest, your success depends upon it. Make an appointment with an Azul Esthetician for a Complimentary Consult. When you come in, be honest about what products you love, what you want to keep and what you’re willing to do for great skin. Let them guide you, filling in any missing pieces to your routine and write down any changes they suggest as replacements for your favorite items. Sometimes they know of a single product that does “double duty” – one of my favorites is Exfoliating Lotion. It renews skin cells and generates collagen, giving double the anti-aging benefit in a single step. The Rejuva Cleanser and Growth Factor Renewal Cream also provide multiple benefits. Before you end your Azul Skincare Consult ask about “lazy-day swaps” – what can you do on your lazy days (or nights)? Simple swaps keep you on track and stop you from feeling like good skincare is an “all or nothing” proposition. Good luck with your simple, new, honest skincare. If we’ve done this right it should be a routine that you can live with and still enjoy great results! We look forward to seeing you for your complimentary Consult – 239-415-7576.